This week’s featured craft actually comes from my site, Pretty Opinionated. 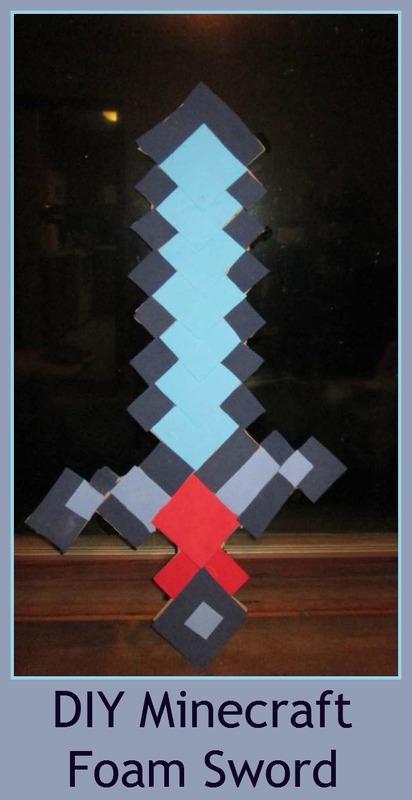 It’s a DIY Minecraft Foam Sword for your little Minecraft fan. Now let me tell you a little secret (although if you’ve been paying attention, it’s not really much of a secret): I am not very crafty! Yet, when my son wanted a $30 Minecraft foam sword from the store, I about fell over. $30 for foam? Have they gone round the bend? So we ran to the craft store and picked up some foam. Then I slaughtered a cardboard box and got to work. Check it out! This DIY Minecraft Foam sword cost me less than $5 to make. Not to bad, right? I included a tutorial and some tips on how to make this Minecraft craft for kids. I’m going to tell you right now, this craft is not a five-minute deal. It took me a good two hours to put it all together. I think those who are more crafty would probably be able to get it done much faster. I work slower because it takes me some time to visualize what I’m doing. I made this Minecraft Foam Sword about 8 months ago and it’s still holding up pretty well! The key is making sure you reinforce the back with some extra tape. But you can read all about that in my post. So go check it out!